As soon as the RNC unveiled its preliminary logo for the Trump Pence 2016 ticket in a fundraising email last week, that very logo became a laughingstock on Twitter, with wags pointing out that the T in Trump appeared to be penetrating the P in Pence. The offending emblem was retired after only a single, embarrassing day. It was a shameful episode that robbed the election cycle of its dignity and grace, threatening to make a mockery of the entire democratic process. Fortunately, as in all times of crisis and need, the internet is ready and able to help. In particular, a logo design community called LogoMyWay, dedicated to connecting clients with designers, has issued forth a clarion call to thousands of artists the world over. The goal: Design a new, more appropriate Trump Pence logo. And did they respond? Did they ever. Dozens of entries are now available for viewing at LogoMyWay. Any of those logos would like fine when emblazoned on an irritable neighbor’s yard sign. They incorporate a patriotic, red-white-and-blue color scheme, and there’s no untoward suggestion of hanky-panky between letters of the alphabet. But they’re a little safe and dull. Fortunately, other contest entrants were a bit more whimsical with their designs. Paully, a graphic designer from Ireland, remembered that the initials TP usually conjure another image entirely in people’s minds. Other logos capitalize on Trump’s single most defining visual element, i.e., his magnificent mane of untamed golden hair. And then? Well, then there is a designer identified as Jkonesko of the United States who brought the contest to a whole other level. 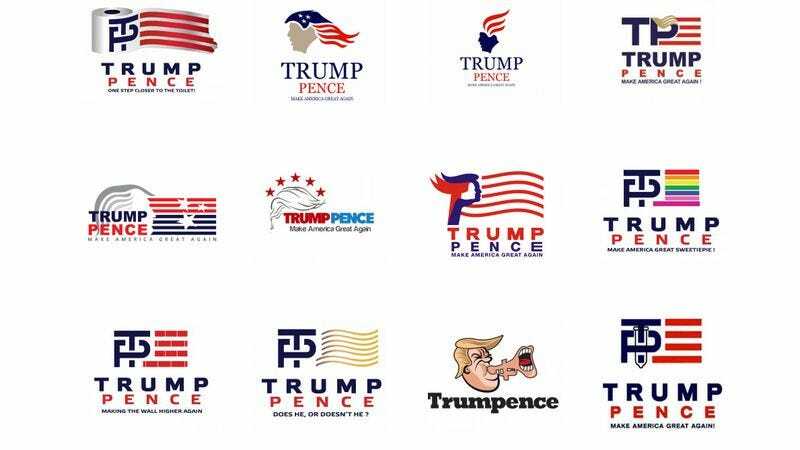 This person’s concept for the Trump Pence logo manages to accomplish several things at once, many of them horrifying. The candidate’s legendary hair is emphasized, yes, but so is his prominent mouth. And the latter is done in a way that puns on the candidate’s last name. Get it? Trump? Trumpet? Besides that, the name of the real estate mogul and the Indiana governor are combined in a portmanteau that suggests the two men have been melded together in some kind of ill-advised scientific experiment. Sweet dreams, America, knowing that this is the Trump Pence logo that the country deserves.